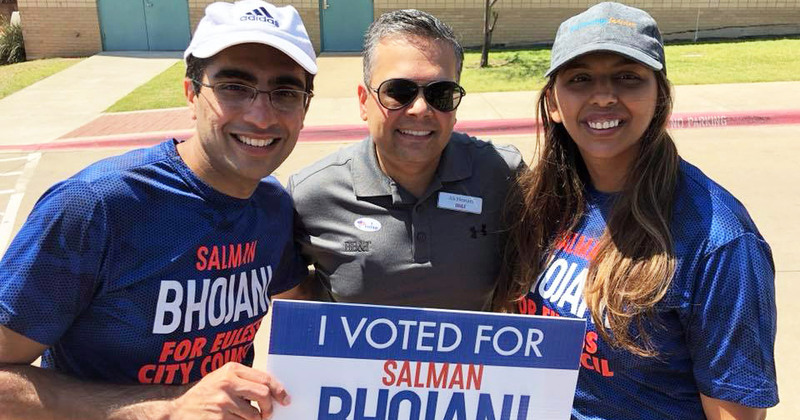 History was made over the weekend as the mid-sized city of Euless, Texas, elected its first Muslim councilman on Saturday, beating a Tea Party candidate endorsed by a powerful Republican representative. Salman Bhojani, a Pakistani immigrant won the race by a narrow 37 votes in the city of 50,000 people. "I am proud to have participated in a race that saw the highest voter turnout in a Euless city election in twenty-five years," he said after winning. "I am also proud to have run a positive, issues-focused campaign that rose above the negativity others sought to inject into the race." The campaign had turned vicious when the Texas House Representative Jonathan Strickland attacked Bhojani as "a Muslim, lawyer, and a lifelong Democrat who supports raising your taxes." He also urged voters to watch how "the Koran was read for the first time at a city council meeting thanks to Mr. Bhojani". But the xenophobic Representative also faced a backlash from Christian leaders in the city. A statement released by a few week ago said: "Clergy leaders in Euless and surrounding areas have been dismayed to see the fires of fear and prejudice stoked against a fellow member of the faith community." "Alongside leaders from Faith in Texas, a multi-faith movement for social justice, these clergy came together to speak out against the hateful and prejudicial remarks made to Mr. Bhojani and his family." Being an immigrant who had moved over from Pakistan, Salman Bhojani started out mopping floors at gas station, to owning several stores himself while attending law school. He then opened his own law firm and practices in the city. After winning he said he would "represent all Euless residents, regardless of whether and for whom they voted, where they come from, how long they have lived in Euless, what faith they practice, or what political party they support." Salman Bhojani will be sworn in later this month.